With a three-decade history of hosting the DCI Eastern Classic in Allentown, Pa., Drum Corps International returns this August to the venerable J. Birney Crum Stadium for two exciting days of World Class competition. Two-night ticket packages to this always-exciting series will give you access to both events taking place on Friday, Aug. 5 & Saturday, Aug. 6. 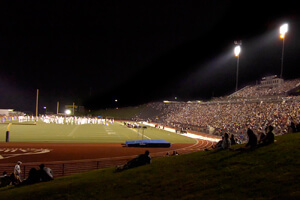 For fans in the East, Allentown is the place to be as one of the last stops on the DCI Tour before corps head to Indianapolis for the 2011 World Championships. Ticket packages will go on sale beginning this Friday, Oct. 29 at 9 a.m. ET. Event: The DCI Eastern Classic Dates: Friday, Aug. 5 & Saturday, Aug. 6 Location: J. Birney Crum Stadium, Allentown, PA Ticket Packages: Range from $30 to $50 To Purchase: Order online or call 317.275.1212 beginning Friday, Oct. 29 at 9 a.m. ET Individual night tickets will go on sale beginning Friday, Jan. 7, 2011. All purchased packages will not be mailed until after January, 2011. View a seating chart, ticket prices and additional information.